V.J. Rice Concrete Limited produces reinforced concrete median barriers (jersey barriers) in several lengths. These barriers are used in numerous applications, including traffic control, property protection, propane and oil tank protection, perimeter fencing, and material retention. 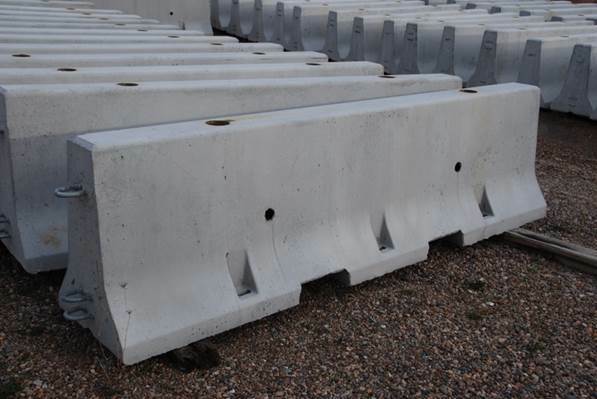 These precast concrete barriers are steel reinforced and engineered to provide maximum impact resistance. Median barriers are produced in three lengths: 1200mm (4’), 2400mm (8’), and 3000mm (9’10”). V.J. Rice Concrete Limited’s 3000mm median barrier meets Nova Scotia Department of Transportation and Infrastructure Renewal’s specifications (“F” Shape NCHRP 350) and come complete with galvanized hardware and connection pins. V.J. Rice Concrete Limited median barriers can be delivered and set in place with appropriate placing equipment where required. These median barriers are also manufactured with precast grooves in the bottom of the unit to enable easy onsite fork handling.